Madonna is expanding her Hard Candy Fitness empire with a new merchandising deal. The Material Girl hitmaker has eight boutique gym locations around the world and she is now partnering up with her manager Guy Oseary and bosses at New Evolution Ventures and Epic Rights to expand the brand into retail products, according to Billboard.com. Epic Rights will reveal more details to potential partners at the 2015 Licensing Expo in Las Vegas June 9 to 11. The singer is also looking to expand her fitness centres into Asia and the U.S. in 2016. Hard Candy Fitness®, the global luxury fitness brand founded by Madonna in partnership with New Evolution Ventures (NeV), will launch an exclusive new dance class series at the Broadway Dance Center in New York titled Dancers’ Access. This dance series marks the first US offering of classes under the Hard Candy Fitness brand, which currently has a growing portfolio of luxury full-service fitness centers in destination cities around the globe. The 20-week series features tour-caliber choreography created and taught by the Hard Candy Fitness Sweat Crew, who also act as Madonna’s personal trainers. It will be the first time the general public will have access to these trainers and content outside of the brand’s international health and fitness club network. 'As the Creative Director of Hard Candy Fitness and the leader of the Sweat Crew, I am thrilled to bring the heart and soul of this brand to the US for the first time and to New York City in particular. It’s especially gratifying that the series of classes will take place at one of the most prominent dance centers in the world,' says Craig Smith, Hard Candy Fitness Creative Director and lead personal trainer for Madonna. Each week, participants will learn choreography inspired by Madonna’s on-stage performances. Dancers’ Access brings innovative, professional-level content on a weekly basis to dancers at one of the biggest dance companies in the world, Broadway Dance Center in Manhattan, which Madonna herself once attended. Elements of the class will include an extensive warm up, performance conditioning, flexibility and cardio needed to perform day after day while on tour, along with learning and performing choreographed content. Classes begin Monday March 2, 2015 and are scheduled every Monday and Wednesday at 6:30 PM. Visit The Broadway Dance Center www.broadwaydancecenter.com. online to reserve your spot and find out more about the Hard Candy Fitness Sweat Crew and Dancers’ Access program. Madonna is being sued over her fitness brand. The 'Hung Up' hitmaker has been accused by beauty and fashion company Hard Candy of maliciously stealing their name to sell exercise DVDs and apparel and the firm have filed a lawsuit in federal court for trademark infringement and unfair competition. The case claims the singer began selling her goods under the Hard Candy name in 2011 despite a previous rejection from the U.S. Patent and Trademark Office. Hard Candy are seeking financial damages and for Madonna to stop using their name completely. He's the Filipino Canadian who danced his way into Madonna's kingdom. Jojo Zolina - in Mumbai to conduct dance workshops - was amongst the 100 who auditioned last year to be a dance instructor at Hard Candy, the pop icon's fitness centre in Toronto. Only 10 were picked and he was one of them. And then, after a month of intense six-hour training sessions every day, he was finally dancing alongside his idol at the grand opening of the centre. 'Madonna is amazing to work with. Her spirit, talent, energy, intelligence, business sense and sheer class is inspiring. She's organised and knows what she wants. Her team knows what to expect of her and she knows what to expect from them. Madonna connects with each of the dancers and doesn't even need to speak. She just has to look at them and she knows if they need help or if they have nailed the routine,' says Jojo, whose training sessions at Mumbai's Temperance India were presented by the Kundu House Project. An instructor for the 'heels class' and 'addicted to sweat', Jojo teaches people who want to lose weight, be active, de-stress as well as those 'who just want to dance to Madonna music'. Madonna and Nicole Winhoffer, her personal trainer for 10 years, select the DJ for the sessions, but Jojo makes a mix of the diva's songs so people are inspired, feel energised and can sing along while working out. So how often does Jojo interact with Madonna? It all depends on what she is doing at that point in time. If she is working on an album and is busy in the studio, he may not see much of her. After an album is released, she tours with pre-selected dancers. But she still remains very involved with the fitness centre, as she and Nicole create the content and programmes for Hard Candy Fitness gyms worldwide. Though Madonna lives in New York, she stays connected with her team on an online video forum. 'They fly down to teach us new choreography. She is open to change as long as the choreography is the same around the world,' says the dancer, dressed in shorts, a black tank top, a sleeveless jacket and sporting a bowler hat. In the next five years, he plans to travel and do more productions. Or he might take a trip down under, not to dance, but to snowboard, surf and explore the mountains. Hard Candy Fitness Toronto have finally published their official footage of Madonna at the launch of the fitness club back in February. Madonna, with her personal trainer Nicole Winhoffer, opened the eighth location of Hard Candy Fitness in Toronto earlier this month, and Madge herself sweated it out to celebrate. For more workout tips and tricks from Madonna’s trainer, follow her on Twitter at @Nicolewinhoffer. Madonna's workouts are tailored to 'shock' her body. The superstar's personal trainer Nicole Winhoffer - who has also worked with the likes of Rachel Weisz and Stella McCartney - says she has been whipping the ultra-toned singer into shape since 2009 thanks to a challenging custom-made fitness program, which is updated every week. The trainer-to-the-stars and Madonna have just opened their eighth Hard Candy Fitness club, and Nicole insists a body like the 'Music' hitmaker's is achievable with hard work and dedication. madonnalicious reader Josh filmed this clip of Madonna arriving at the launch party for the Toronto branch of Hard Candy Fitness that took place last night. Madonna fans can expect to hear some new tunes in the future from the music icon with plans for a new album - but she's keeping a tight lid on the details. 'Yes, plans are in the works already. Don't ask me with who, it's a secret, top secret,' Madonna said coyly in a red carpet interview Tuesday night at Hard Candy Fitness club in Toronto. In the meantime, fitness was top of mind for the pop superstar who paid a visit north of the border for the official launch of her luxury fitness brand in Canada. The Hard Candy Fitness Toronto club opened for business in October, joining international locations in Berlin, Rome, Sydney, Santiago, Mexico City, Moscow and St. Petersburg. In addition to the large-scale images of the Material Girl emblazoned on the walls throughout the facility, Madonna also has a hand in shaping the fitness routines with classes based on her daily workouts. Madonna said dance has always been a big part of her shows and she can't imagine not having movement, dance and fitness being part of her work - a philosophy she's applied to her burgeoning fitness brand. 'I have fun working out and I don't think working out should be boring. And I think dance is an important part of a workout,' said Madonna, looking elegant in a sleek black blazer and skirt designed by famed Canadian duo DSquared2, accessorized with black and gold gloves. A select few got to see Madonna in action as she led the cardio-based Addicted to Sweat class, which combines elements of high-impact aerobics with choreography. The session was closed to the media, but among the participants were 30 people who earned the chance to dance alongside the pop diva following several auditions. 'Just to have a window into that world, it's a once in a lifetime incredible opportunity. It's like being in a dream,' said class participant Blair Boudreau prior to taking part in the session. So are there any Canadian artists on Madonna's workout playlist? When asked, she responded: 'Drake.' And would she like to collaborate with the homegrown hip-hop star in the future? 'If he'll have me,' Madonna replied. Here are a couple of press pictures from the launch night of Hard Candy Fitness in Toronto that took place yesterday. 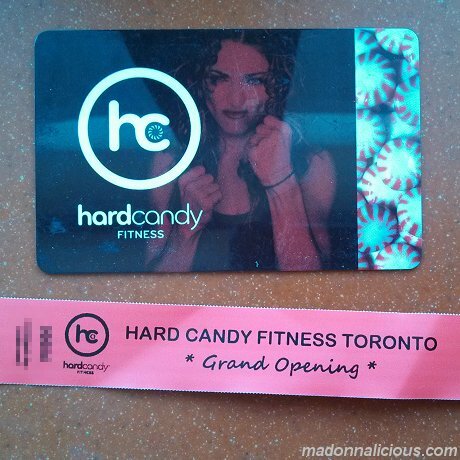 madonnalicious reader Oscar is lucky enough to be attending the official opening of Hard Candy Fitness in Toronto on Tuesday 11 February. Pictured below are his pass and wristband to attend the event. Madonna is to attend and will lead a class of successful auditionees in an 'Addicted to Sweat' class. Jamie Madigan has been a Madonna devotee since his teen years when he was listening to 'True Blue' on cassette and watching the music icon perform during her Girlie Show tour stop in Toronto - his first concert in high school. So when Madigan learned Madonna's Hard Candy Fitness was opening in Canada, the pop idol's connection to the luxury gym brand was his main motivation for enrolling. In recent weeks, the Material Girl has given Madigan added incentive to squeeze in additional training as the 37-year-old competes for the chance to break a sweat alongside Madonna during her upcoming Canadian visit. She will be in Toronto on Tuesday for the official launch of the Hard Candy Fitness facility. The Canadian club opened for workouts in October, joining international locations in Berlin, Rome, Sydney, Santiago, Mexico City, Moscow and St. Petersburg. Madigan is among the hopefuls vying to fill 30 spots in the cardio-based Addicted to Sweat class that the pop diva will be leading. The classes were created by Madonna and are based on her daily workouts. Tim Anderson, Madonna's personal trainer from her 'MDNA' tour, will be making the final selections at callback auditions on Monday. Group exercise director Lori Kirwan said the class blends the best of the dance and fitness worlds, meshing elements of high-impact aerobics with choreography. The hour-long Addicted to Sweat class in Toronto comprises a warmup, cardio and intensive stretching, strengthening and toning work involving the use of towels. A component of the towel exercises involves placing them under the feet while individuals are in plank position and sliding in different directions, working the core and inner thighs, Kirwan noted. Cyndy Love-Minns was an avid dancer in her younger days, and is no stranger to the audition experience, previously vying for a spot in the National Ballet School. Still, the 57-year-old was a bundle of nerves and excitement as she competed for a chance to work out with Madonna, making it to the final callback. Love-Minns said even if she doesn't make the final cut, she's happy to have reached the last stage in the process and pleased with the progress she's seen in her fitness, which includes losing eight pounds since December. Hard Candy Fitness published this video clip of Madonna taking part in a work-out at the official launch of the latest Hard Candy Fitness club in Berlin. Post by Hard Candy Fitness. Here are some pictures from the Hard Candy Fitness club launch in Berlin last night. Madonna is not only the 'Queen of Pop' but also the Queen of fitness. On thursday she came to Germany's capital to host the opening of the first Hard Candy fitness club in Berlin. The studio is located outside the city's center in the Dahlem district. Fans gathered in the rain to welcome their idol, who was running more than an hour late but later pleased her fans by signing autographs. Dressed in black leather pants and a black leather jacket she posed for photographers and gave interviews to a few journalists. Nicole Winhoffer, Madonna's personal trainer and their colleagues from New York and Berlin presented the crowd with a little taste of what they can expect at Madonna's fitness clubs, which are named after her Hard Candy album, released in 2008. 'This Berlin location is beautiful inside. There are skylights, there's windows, we have many different programs. We also offer for the members, keycards where all of their workout information is stored on their personal membership key. So there's a lot of new things that Madonna and I are super excited about and everybody should check out the Berlin 'Hard Candy' fitness location,' said Ms Winhoffer. The club hosts the latest in strength equipment, a 25-meter pool, a steam room, sauna and three large terraces providing plenty of space to exercise as well as relax. 'So a variety in the workouts is super key or else your body is gonna plateau. We don't want that. You can see that Madonna is a poster child for having a body that's always in tip top shape because she is always changing her workouts. So she was excited to bring that variety to 'Hard Candy,'' said Ms Winthoffer. There are also Hard Candy fitness centers in Mexico City, Moscow, Rome, Santiago, Chile, St. Petersburg, Russia, Sydney and Toronto. Interested in an audition slot for Madonna's upcoming Addicted To Sweat class in Berlin (Oct 17th)? Upload a Youtube video (4 minutes or less) or Instagram video of you dancing to one of the MDNA Live album tracks. Share it using the #HCFBerlin hashtag for a chance to audition! Madonna will host the official grand opening of her first Hard Candy Fitness location in Berlin on Thursday, October 17th, 2013. The club, located at Clayallee 171-177, will be the first of several Hard Candy Fitness locations in the city developed in partnership with fitness entrepreneurs Dr. Jurgen Jopp and Ralf Jopp. The club boasts a 25-meter pool, steam room, sauna, cafe, and three large terraces providing plenty of space to exercise and outdoor relaxation. The facility spans almost 2,500 square meters, allowing members to enjoy stunning views of the man-made lake specially created for the new Funf Morgen Urban Village. Members also have access to the most revolutionary strength equipment and free weights, along with dedicated spaces for personal training, group cycling, yoga, Pilates, and a large group fitness studio with floor to ceiling windows. 'We are thrilled to bring this unique and dynamic fitness brand to Germany, and are honored to have Madonna host our official grand opening,' stated Dr. Jurgen Jopp. Madonna is scheduled to teach her signature Addicted to Sweat cardio based dance class in the club with the Hard Candy Fitness Dance Team as part of the festivities. Members of Hard Candy Fitness Berlin will be allowed to audition for this special workout. Members can sign up online at www.hardcandyfitness.de, or at the club. On Thursday, October 17, the selected winners will work with the Hard Candy Fitness Dance Team to learn the Addicted to Sweat training routine. The event will culminate with Madonna leading the class in the workout. 'I'm looking forward to getting Berlin 'Addicted to Sweat' and am excited to be attending the grand opening of the first of several Hard Candy Fitness Clubs in Germany,' commented Madonna. For more information about Hard Candy Fitness Berlin and exclusive membership opportunities, visit www.hardcandyfitness.de. For more information about entering for a chance to be part of the auditions, visit the above website or visit the club at Clayallee 171-177, 14195, Berlin. Madonna visited her soon-to-open Hard Candy Fitness club in Rome Wednesday evening where she signed the club’s mantra, “Harder Is Better” on the wall. She also hosted an intimate screening of “Secret Project” at the club for a select group of members, friends and fans. The 17 minute film about tolerance, freedom and love was created by Madonna and Steven Klein. During a tour of the facility prior to the screening, Madonna was most enthusiastic about the group fitness studio which has a special floating dance floor where members will perform the brand’s signature Addicted to Sweat workout programs, which are based on her personal workout routine. The club will be the first of several Hard Candy Fitness locations planned for Rome and was developed in partnership with Dabliu, one of largest Italian networks in the fitness industry. The first location – a 13,000 square foot facility across from the Coliseum will open for workouts in October with a grand opening event scheduled at that time... An enrollment center is now open at Via Capo d’Africa, 5 and early memberships are currently being offered at exclusive, limited time special rates. The second location of Hard Candy Fitness is on Viale Romania, 22 – near the center of the city... The facility will be a conversion of a 21,000 square foot Dabliu Parioli club and is also scheduled to open October 2013. 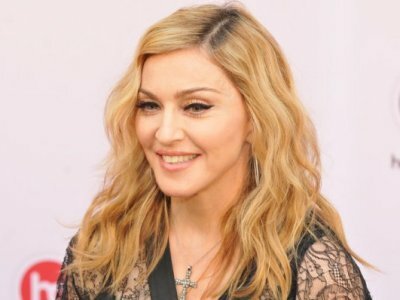 Hard Candy Fitness, founded in partnership with Madonna and New Evolution Ventures (NeV), has also recently announced that the first of several Hard Candy Fitness clubs in Berlin will open in September, joining the current locations in Sydney, Santiago, Mexico City, Moscow, and St. Petersburg, Russia. The brand is expected to announce the opening of multiple locations this year as it continues its expansion into destination cities around the world. For more information about Hard Candy Fitness Rome and exclusive membership opportunities, contact Hard Candy Fitness Colosseo, T. +39-06-70490452, or visit http://www.hcfroma.com/contattaci/ and www.hardcandyfitnessrome.it. 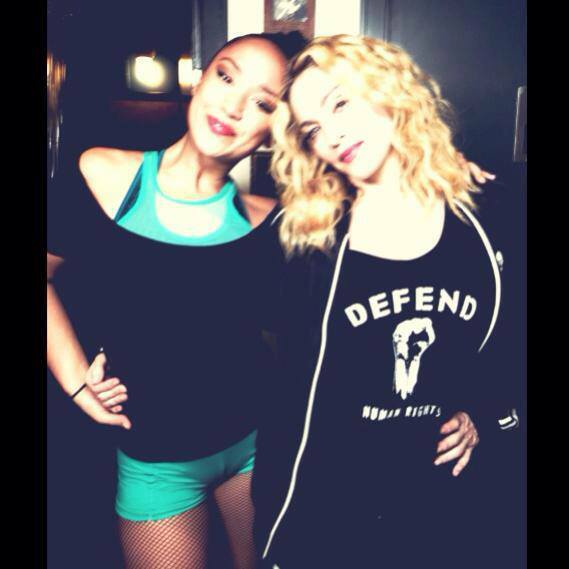 Hard Candy Fitness published this picture of Madonna and trainer Nicole Winhoffer after an Addicted to Sweat workout. After the recent launch of her new luxury Hard Candy Fitness center in Rome, Madonna has just announced plans to expand her fitness empire to Berlin. Her second location in Europe, the new club will come equipped with dance studios, weight rooms, swimming pools, Jacuzzi and a lounge with a bar to relax and hang out, and is set to open in September. Madonna and her trainer, Nicole Winhoffer, also recently released a series of four workout DVDs featuring Winhoffer and incorporating objects such as a bathroom towel and a sturdy chair into the routines. The set, 'Addicted to Sweat,' is based on the same high-impact dance workout programs Madonna relies on to achieve her svelte physique. The Material Girl opened the first Hard Candy gym in Mexico City in 2010 and has since launched clubs in Moscow, Sydney, St. Petersburg, and Santiago. Nicole Winhoffer, professional dancer and personal trainer to the Madonna was interviewed by Cynthia McFadden on ABC's Good Morning America. Madonna is planning to open a gym in the centre of Rome, across from the Colosseum Roman amphitheatre, this spring. The Italian-American pop star and actress founded the Hard Candy Fitness global luxury fitness brand in partnership with New Evolution Ventures. The brand has entered into a partnership with Dabliu, one of largest Italian networks in the fitness industry, to develop the Rome market. The gym will be housed in a 13,000 square foot location in the heart of Rome’s historic centre. The three-storey, amenity-packed club will include studios for yoga and group fitness. The brand’s ‘Addicted to Sweat’ programmes based on the same routines Madonna uses to stay fit, and which were recently released on DVD, will be featured. The fitness centre will offer a selection of traditional group fitness classes, designated spaces for functional and personal training, and a coffee bar. Members can also enjoy a cycling studio resting in a balcony overlooking the club’s main floor. 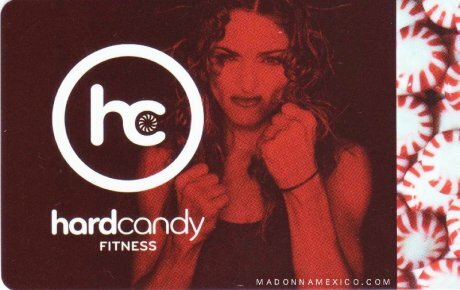 Madonna opened the first Hard Candy Fitness in Mexico City in 2010. Since then, she has launched clubs in Moscow, Sydney, and Santiago in Chile. The pop icon is expected to announce the opening of several other gyms this year as the chain continues its expansion around the world. Madonna's personal trainer says the star's 'fit body' is the only thing that gets her through the day. The Vogue songstress is launching a new DVD series called Addicted to Sweat with her trainer Nicole Winhoffer. Nicole says that Madonna has been highly involved in all aspects of the workout DVD production, from the music, the routine and the final look of each volume in the series. 'Fitness is so important to her because she's one to empower people. She is an example - not just as a pop icon, but an example as a businesswoman, an entrepreneur, a woman that's in shape,' Nicole explained to The Huffington Post. The famously toned pop legend has long been known for her love of working out. Nicole says the star is planning on bringing her branded gym studios, which are already up and running in Mexico, to the US in the future. It was through pursuing her Mexico gym dream that Madonna realised her desire to release an at home fitness DVD. Madonna puts in a 110 per cent effort to keep herself in shape. The 54-year-old singer works with Nicole Winhoffer - who is the creative director of her Hard Candy Fitness gyms - to maintain her incredible figure and the trainer says it is all about putting plenty of hard work. Nicole also encourages the 'Material Girl' singer to set goals for herself to stay on target. 'The Addicted To Sweat series is inspired by my weekly workout regimen that helps me take care of my mind and body,' commented Madonna. In the DVD series, Winhoffer showcases and teaches the Hard Candy Fitness' results-driven techniques and programming created by Madonna, which blends innovative dance, toning and cardio training. DVD ONE- ATS DANCE: GET WET Structured like a dance class, Winhoffer breaks down all steps in this tutorial-style DVD. It will hone in on the importance of form and focus to perfect choreographed dances, strengthen the core, and reach optimum results. DVD TWO- JAW BREAKER TOWEL: SLIPPERY WHEN WET A unique, total body conditioning workout that targets every muscle during a short, intense routine that pays special attention to abs, core, arms, chest and back. DVD THREE- ATS DANCE: WET, WET, WILD Building from DVD one, Winhoffer pushes the dance skills to the next level, featuring more diverse moves that increase the power of the workout. DVD FOUR- JAW BREAKER CHAIR: DRIPPING WET A chair and the floor are the only tools required for this extreme workout aimed at sculpting, toning and tightening the entire body. A Hard Candy Fitness centre has now opened in Sydney, Australia. Madonna works out daily, even during her world tours. She has used thousands of fitness centres and trained with some of the top personal trainers and dancers in the world. From this experience, she has developed a strong vision of the ideal exercise, dancing and workout environment. Welcome to Hard Candy Fitness. Enjoy the huge assortment of unique training programs and signature classes at your new club! You can dance... for perspiration. Madonna is introducing a series of workout videos called 'Addicted to Sweat,' for fans who want to get fit while learning her dance moves. The dance-based workout, which was designed by the 54 year-old star and her personal trainer Nicole Winhoffer, is designed to promote agility, flexibility, and strength. No gym required - all you need is a chair and the floor. The workout is the latest from Madonna’s entry in the world of fitness since she began opening Hard Candy, her global chain of fitness centers. She opened the first Hard Candy in Mexico City in 2010 and it expanding to Russia and South America. Here are the first press pictures from Madonna's appearance at the official opening of the Hard Candy Fitness centre in Moscow that is taking place this evening. Hard Candy Fitness, the global luxury fitness brand will celebrate the success of its newest Moscow location with an official Grand Opening event on August 6. Madonna, whose MDNA Tour arrives in Moscow in August, will be attending the festivities along with the dancers from her tour. Hard Candy Fitness Moscow, which opened its doors in December 2011, has quickly become the hottest fitness destination to hit Red Square, boasting 3,500 square meters of top of the line amenities and programming allowing its members to work out hard and relax in luxury. Madonna’s influence and design is seen and felt throughout this stunning new facility. 'Moscow is one of my favorite cities and my dancers and I are looking forward to celebrating at this beautiful club’s official August 6th opening', commented Madonna. Madonna’s personal trainer Nicole Winhoffer is also scheduled to attend the VIP gala. Following the festivities at Hard Candy Fitness Moscow, the celebration will continue at a highly anticipated after party at SOHO ROOMS. Hard Candy Fitness, the global luxury fitness brand will celebrate the success of its newest Moscow location with an official Grand Opening event on August 6. Madonna, whose MDNA Tour arrives in Moscow in August, will be attending the festivities along with the dancers from her tour. Hard Candy Fitness Moscow , which opened its doors in December 2011 , has quickly become the hottest fitness destination to hit Red Square, boasting 3,500 square meters of top of the line amenities and programming allowing its members to work out hard and relax in luxury. Madonna's influence and design is seen and felt throughout this stunning new facility. 'Moscow is one of my favorite cities and my dancers and I are looking forward to celebrating at this beautiful club's official August 6th opening,' commented Madonna. Madonna's personal trainer Nicole Winhoffer is also scheduled to attend the VIP gala. Following the festivities at Hard Candy Fitness Moscow, the celebration will continue at a highly anticipated after party at SOHO ROOMS. Hard Candy Fitness Moscow incorporates high end design and finishes to the brand's signature 'Addicted To Sweat' group programming based on Madonna's own workout regime. Club highlights include a group fitness studio with a specialized dance floor, the first anti-gravity yoga studio in Moscow, a first class pool and spa, and the industry's most advanced workout equipment. Hard Candy Fitness is opening a new centre in Santiago, Chile in April. This is the first in South America and the third on the world. Madonna in partnership with her manager Guy Oseary and Mark Mastrov, Chairman of New Evolution Ventures (NeV), announced their second Hard Candy Fitness Center in Moscow is now open for workouts. The beautifully designed, four-floor, 35,000 square foot facility near the Red Square, plans to host Madonna for a visit in 2012. The Hard Candy Fitness Center in Russia is operated by Irina Razumova, founder of the well known Russian chain Planet Fitness. The opening of this latest facility follows the one-year anniversary of the Hard Candy Fitness Center in Mexico City. Hard Candy Fitness Moscow has state of the art equipment, an exclusive curriculum along with Mind Body Studio including the Great Wall, a Bike Studio, a Juice Bar/Cafe, lavish locker rooms and a 25 meter-long pool. Members will have the very best in innovative fitness programming including traditional classes, the newest trends in Yoga and original classes designed specifically for Hard Candy Fitness. The design and programming of the Hard Candy Fitness Centers are inspired by Madonna's vision and commitment to fitness. Members will experience this first hand with signature Addicted to Sweat classes, featuring movements exclusively designed by the pop icon and her dance team. The Addicted to Sweat Cardio Dance and Jaw Breaker classes were inspired by the same choreography and toning exercises used in Madonna's personal fitness regime. The facility contains more than 100 pieces of strength equipment / free weights with the best functional training accessories from Precor, Hoist, Free Motion, Concept and TRX suspension training. Hard Candy Fitness team members will sport the latest adidas by Stella McCartney and Porsche Designs attire from Winter 2011-2012 adidas collection. The Hard Candy Fitness brand launched its continued expansion with a third location set to open for workouts in St. Petersburg, Russia early spring next year. Hard Candy Fitness will also make its mark on new territory, heading to Toronto, Canada in 2012. NeV's Mastrov and partners, along with Madonna and Guy Oseary are also exploring options of building additional Hard Candy locations in Italy, United Kingdom, Canada, France, Australia, Argentina, and Brazil, for facilities that will offer a unique member experience. For membership information, visit the newest Hard Candy Fitness at B. Kislovskiy per 9, Moscow Russia 125009 or call +7 495 933 71 00. Madonna’s third Hard Candy Fitness Center in St. Petersburg, Russia, a beautifully designed 52,000 square foot space in the center of the city is projected to open in mid-2011, it was confirmed today by Mark Mastrov, Chairman of New Evolution Ventures (NeV). The announcement of this latest facility follows the recent opening of the Mexico City Hard Candy Fitness and confirmation of plans for a Hard Candy Fitness Center in Moscow. The St. Petersburg location holds special meaning for Madonna. 'St Petersburg, Russia was one of the most magical nights on my ‘Sticky & Sweet’ Tour and I’m thrilled that we’ve found the perfect location and ideal environment there for the next Hard Candy Fitness,' commented Madonna. Both the Moscow and St. Petersburg location will be in partnership with Irina Razumova, founder of the well-known Russian chain Planet Fitness. 'We are honored to collaborate with Madonna and her team in designing and developing a beautiful facility like no other in the world,' stated Razumova. NeV’s Mastrov, his partner Jim Rowley, along with Madonna and Guy Oseary are also exploring options of building additional Hard Candy locations in Italy, United Kingdom, Canada, France, Australia, Argentina, and Brazil, for facilities that will offer a unique member experience. Hard Candy Fitness Centers will include state of the art equipment, exclusive curriculum along with Mind Body Studio, The Great Wall, Sculpting, barre3, a Bike Studio, Capoeira, the newest trends in Yoga, a Juice Bar/Café and lavish locker rooms. 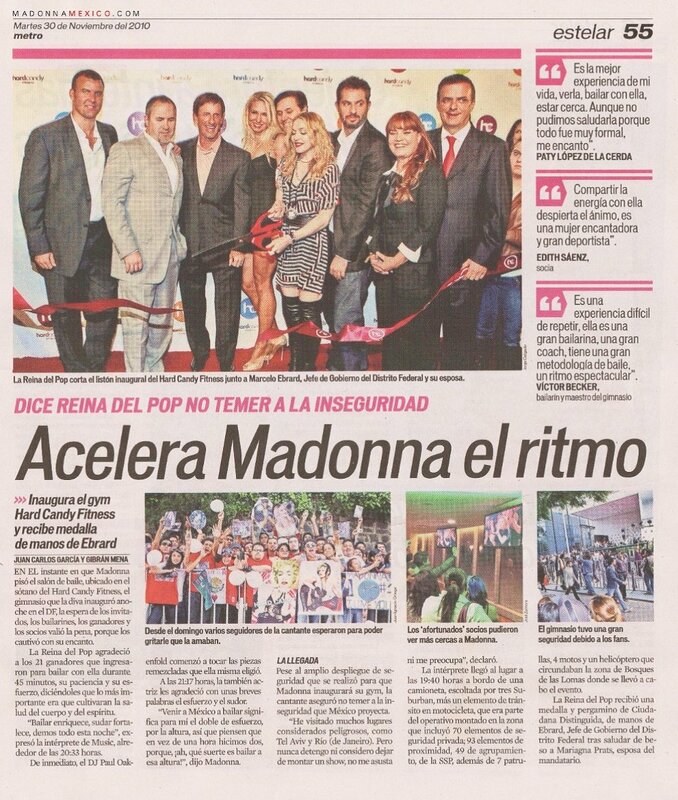 'The early success of the first Hard Candy Fitness Center in Mexico City - where Madonna taught a dance class to members at the opening - has inspired us all to create similar facilities and seek out local partnerships around the globe which embody Madonna’s workout philosophy. St. Petersburg and other locations of Hard Candy Fitness will be a place where members will enjoy their workout experience in a beautiful environment in each city,' commented Mastrov. Due to tremendous interest and the many inquiries NeV has received from all over the world about Hard Candy Fitness Centers, fans have been asked to voice their choice for the next location by going to www.madonna.com/hardcandyfitness and vote on the interactive map for your dream location. Queen of pop and health guru Madonna will open a gym early next year near Red Square for Moscow's designer-clad elite, who spend exorbitant sums on a fitness frenzy that has gripped the capital. The state-of-the-art gym, to open in mid-March, will be the second of Madonna's 'Hard Candy Fitness' gyms. The 52-year-old launched the brand in Mexico City last month. 'I know that we will create the ideal workout environment in Moscow,' the American singer said in a statement. The spacious 35,000 square feet (3,250 square meter) gym is a partnership between Madonna, the U.S.-based private equity firm New Evolution Ventures (NeV) and Irina Razumova, founder of Russian luxury gym chain Planet Fitness. Western-style gyms have mushroomed across Russia in recent years, with Moscow memberships costing as much as $25,000 a year. Demand for designer gym clothes has soared. Prime Minister Vladimir Putin, a judo black belt, has said fitness is vital for his nation, where male life expectancy is just 59. NeV is eyeing 10 more Hard Candy gyms in Brazil, Argentina, Europe and Asia, the statement said. Madonna in partnership with her manager Guy Oseary and Mark Mastrov, Chairman of New Evolution Ventures (NeV), announced the opening of the second Hard Candy Fitness Center in Moscow which is projected to open in mid-March 2011. The new facility will be a beautifully designed and unique 35,000 square foot space located near Red Square. Moscow’s Hard Candy Fitness will also include a partnership with Irina Razumova, founder of the well know Russian chain Planet Fitness. The news of the Moscow location comes on the heels of a successful grand opening for the brand’s premiere location last week in Mexico City, which featured a special dance class taught by Madonna. 'It’s especially exciting to have the second Hard Candy Fitness open in Moscow as I really enjoyed the city and the people when I visited during my ‘Sticky & Sweet Tour.’ Working in collaboration with the experts at NeV and Irina, I know that we will create the ideal workout environment in Moscow that represents my health and fitness philosophy as well as include innovative and inspiring programs,' commented Madonna. Mastrov, his partner Jim Rowley of NeV, along with Madonna and Oseary are in the planning stages of opening 10 additional Hard Candy locations in Russia, Brazil, Argentina, Europe and Asia. They are currently exploring opportunities around the globe for facilities that will offer a unique member experience in all aspects including curriculum, environment and fashion. Throughout her career, Madonna has been devoted to fitness and well being. Having worked out in hundreds of gyms around the world, she developed a strong vision on what the ideal exercise, dance and workout environment should look like. The vision took shape during an initial meeting between Mark Mastrov, the innovator behind some of the World’s best known Fitness Brands and Guy Oseary early in 2008. Mastrov has built a fitness empire of over 1100 clubs in over 20 countries. 'Our goal is to create an environment around the world inspired by Madonna's vision and high standards. Hard Candy Fitness Centers will be a reflection of Madonna's point of view and will reveal her input on every detail including music, design and class curriculum. Madonna's touch will be everywhere,' stated Mastrov. The Moscow Hard Candy Fitness Center along with others in the planning stages will include proprietary Hard Candy Fitness programming inspired by Madonna and her dance team, a Bike Studio as well as a Mind Body Studio, featuring The Great Wall, where members can practice BarWorks, Sculpting, Capoeira and the newest trends in Yoga. It will also house a healthy alternative Juice Bar/Café and lavish locker rooms. Members will benefit from state of the art cardiovascular equipment with personal viewing screens, more than 60 pieces of strength equipment/free weights and the best group fitness, functional training accessories using brands including Precor, Marpo Kinetics, Hoist, Free Motion, StarTrac and TRX suspension training. 'We are so excited and honored to be able to open the Hard Candy Fitness brand here in Moscow. 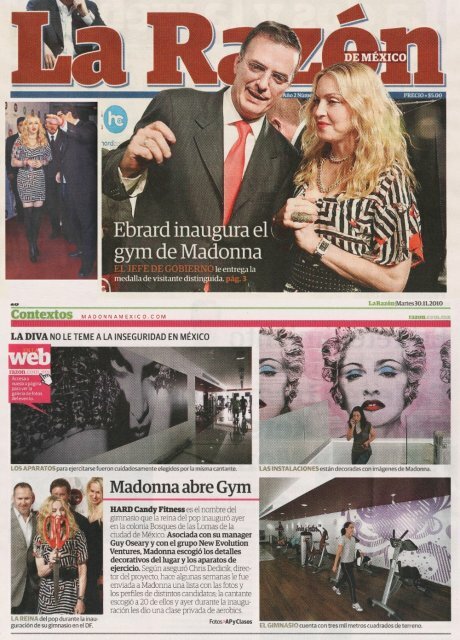 Madonna has been an inspiration for us all and we can’t wait to bring this beautiful facility to life,' said Irina Razumova, partner with Hard Candy Fitness and NeV.
Mexican authorities have given Madonna's fitness club the green light to open after saying the gym was in danger of being shut down because it lacked several permits. Authorities in the Miguel Hidalgo district, where the gym is located, said Wednesday that the legal representatives of the singer's Hard Candy Fitness had presented all the missing documents and the gym is free to begin operating. Madonna attended the ribbon-cutting and taught a dance class for 20 hand-picked gym members with music by Paul Oakenfold, the DJ who opened her last tour. Membership at the gym costs about $159 a month. It costs $827 to join and that includes the first two months. Sodi, a longtime political figure in Mexico, is the uncle of Latin Grammy winner Thalia. 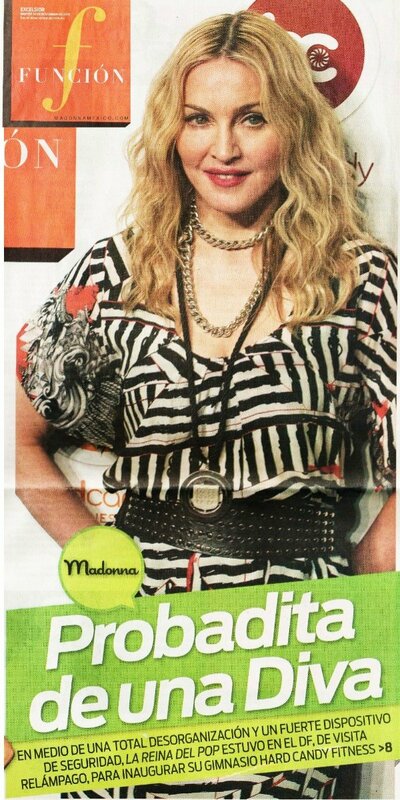 Fellow fansite www.madonnamexico.com have shared even more scans from Mexican newspapers about the Hard Candy Fitness launch party that took place last week. Click on the articles to enlarge. Here are more scans from the Mexican press about Madonna's launch of the Hard Candy Fitness centre in Mexico City - click on the images to enlarge. Local TV reports have revealed the queen of pop forgot to apply for a land permit before opening the facility and has a deadline of today (Friday) to do so. The singer also needs to present a certificate to show that the gym has parking facilities. Madge opened the gym this week with a dance class. Punters have already paid £500 in joining fees for their memberships. 'Our plan is to use Mexico as a place to fine-tune our brand and then expand it,' she added. 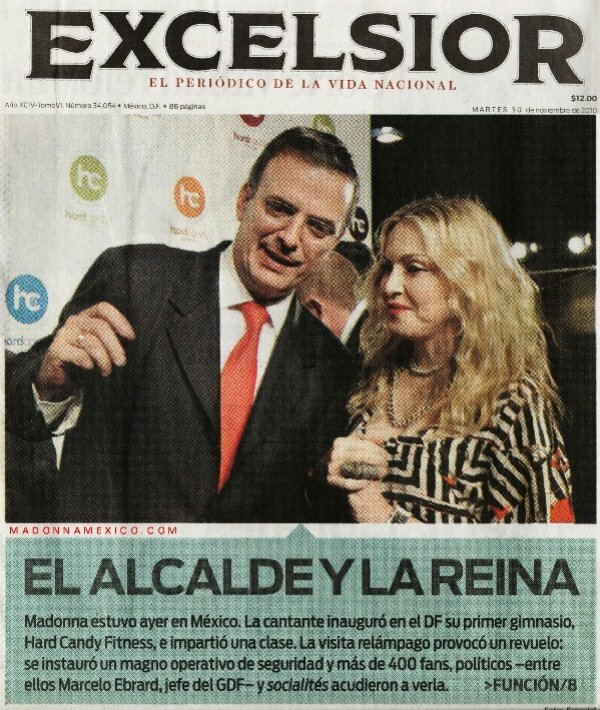 Here is some video footage from Mexican TV of Madonna leading a class on the launch night of Hard Candy Fitness. Sky News have broadcast this video clip of Madonna being interviewed on the red carpet at the launch party for Hard Candy Fitness in Mexico City last night. Here are some pictures released to the press from the red carpet ribbon-cutting ceremony at the Hard Candy Fitness launch party that took place last night. She writes children's books and makes wine, dons a spandex leotard like no one else and has sold millions of albums around the world. Now she wants you to have a toned body. Madonna launched her new brand of 'Hard Candy Fitness' gyms in Mexico City on Monday, opening a huge, 30,000-square-foot (2,787-square-meter) compound where Mexico's rich and the beautiful can go through dance classes and fitness routines inspired by the singer's routines. So why choose a sprawling metropolis of some 20 million people, struggling with crime, pollution and endless traffic jams to kick off an international sports venture that may eventually include gyms in Russia, Brazil and Argentina? 'I have a history with Mexico,' Madonna, wearing a black and white-striped dress with boots, told Reuters. 'I have a connection that I have always felt anyways because of my love and interest in Frida Kahlo,' she added, referring to one of Mexico's best-known 20th century painters. Hundreds of screaming fans, from boys wearing 'Mexicans do it better' T-shirts to drag queens in leg warmers, lined up outside the gym in a fruitless effort to get a glimpse of the singer, who arrived tightly protected by security. Guests at the launch included the capital's mayor, Marcelo Ebrard, and Carlos Slim Domit, the son of the world's richest man, Carlos Slim. Inside the new gym, Madonna taught a short dance lesson to a handful of lucky gym members handpicked by her staff to join her on the dance floor for a few minutes. She said she is getting ready for another busy year in 2011 that will include a new movie and an album that would follow on the steps of her highly successful 'Hard Candy' studio album. Asked whether she would pursue new collaborations as she did with stars such as Justin Timberlake, she said only that she is working with fellow artists. On the home front, the mother of four kept open the possibility of expanding her brood. madonnalicious reader materialboy75 filmed this video clip of three trucks driving in convoy advertising Madonna's Hard Candy Fitness in Mexico City. Here are three posters promoting the members only launch party for Hard Candy Fitness that takes place in Mexico City tonight (Monday 29 November) - with Madonna and DJ Paul Oakenfold in attendance. Another poster shows what classes are available for those signed up. 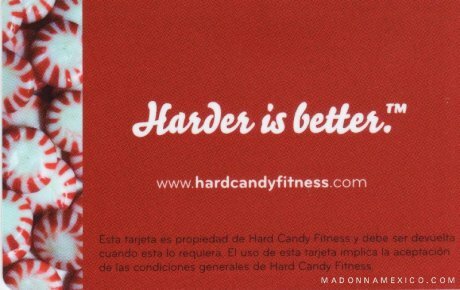 This Hard Candy Fitness card features an even older Madonna image on it - rather than the Sticky & Sweet images previously seen in other promotional pictures - but still follows the 'boxing' theme. Also pictured is one of the Hard Candy Fitness wristbands that will gain entrance for members to the venue. 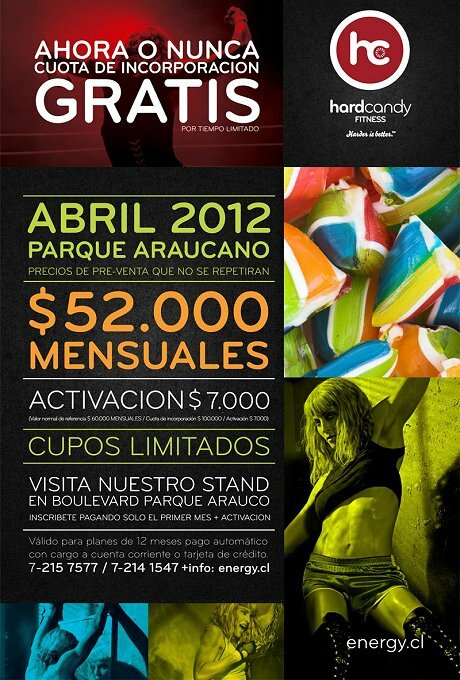 Here is a look at a promotional poster for the launch party of Hard Candy Fitness in Mexico City on Monday 29 November. The Hard Candy Fitness venue in Mexico City is almost ready for the launch party next Monday as this picture from madonnalicious readers Roby and Pablo shows. In this video clip shot outside the entrance by madonnalicious reader materialboy75 shows cameras being set up - possibly ready to film Madonna'a arrival! ‘Medellín’ streaming for the first time at 9PT 12ET 17 GMT #WorldRecord. RAFAEL PULEO on Medellin Premieres! Darrell Murphy on Medellin Premieres! All comments are the property of the posters alone.